If you’re like me who owns multiple devices like smartphone tablets, Bluetooth speakers, smart watches, then you know charging all of them at once is a pain if you have limited power outlets or adapters. Now every new device that we get comes with a USB charger. Weather you have a Phone, tablet or speaker all the devices get charged using USB. When you start to load up on devices and they come with their own power brick and after a while you run out of places to plug them in and That is where USB charging stations come in. 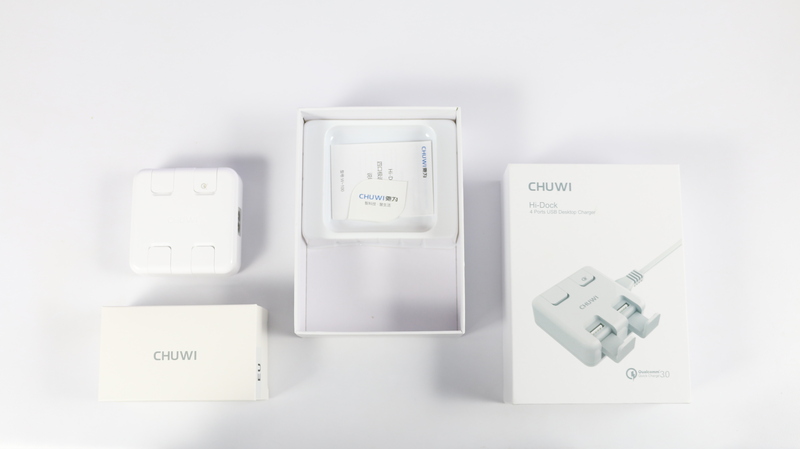 So today I will be reviewing Chuwi’s Hi-Dock which is a Charging hub and it can charge 4 devices at a time, and by the way it also supports QUALCOMM quick charge 3.0 technology. 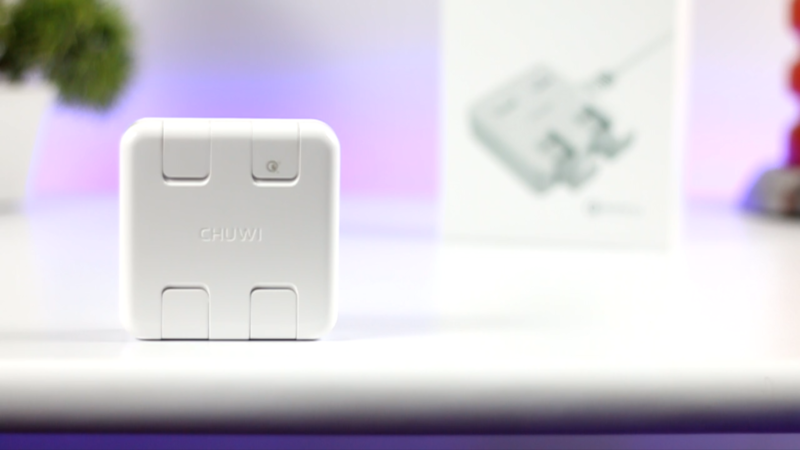 Now before we get started I would like to announce that we will be giving away 5 Chuwi’s Hi-Dock to my subscribers and a huge shout out to Chuwi for sponsoring this giveaway and this is going to be an international giveaway. Since you’re setting up a desktop charger, getting started takes just a few minutes. 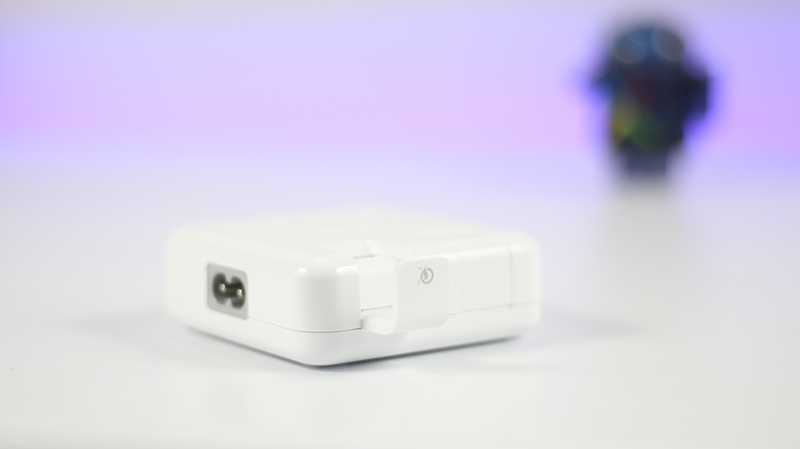 The Hi-Dock is packaged in a small, attractive all white box with an Apple-like aesthetic. And the similarities aren’t just skin deep.Opening the package reveals the charger itself and a small box that contains the power cord. 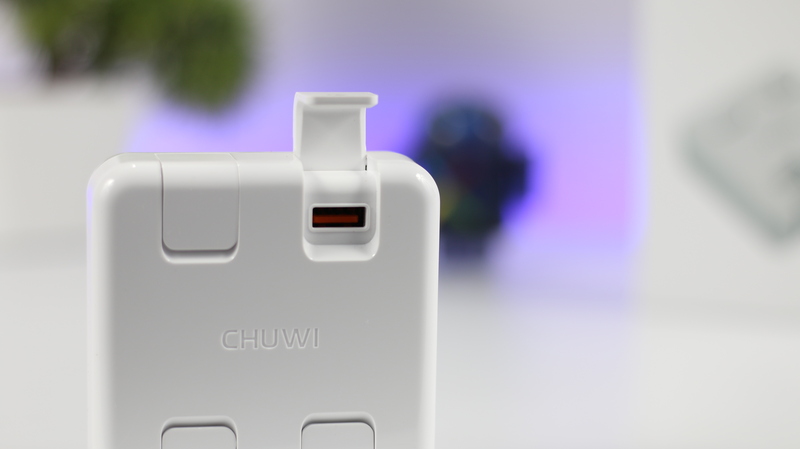 Talking about the aesthetics the Chuwi Hi-Dock is a quite handy and compact charging hub that weighs only 147g. 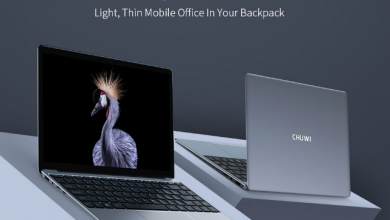 While the Hi-Dock is just a little bigger than a MacBook charger with the same glossy white vibe, the USB ports are more spread out with two placed on each side and covered with a movable bracket that also doubles as a device stand. Now if you have one of the latest smartphones that support QC 3.0, then this hub is a good fit. Along with three normal USB plugs, one USB outlet — in orange — can charge compatible devices that support Qualcomm’s Quick Charge 3.0 technology. 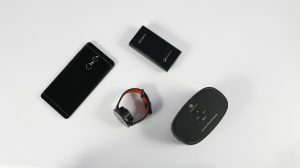 That usually found on Android devices and provide up to 17W of maximum power. 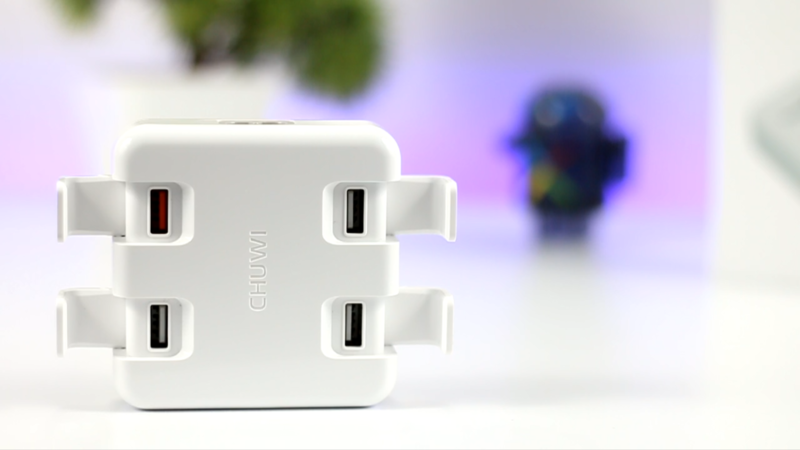 Now may be some of you may think that why only one port for quick charging, I think the reason could be the price, Chuwi could’ve supported quick charging on all or at least two of the ports, but that would’ve bumped up the cost as this charging hub will just cost you 20$. 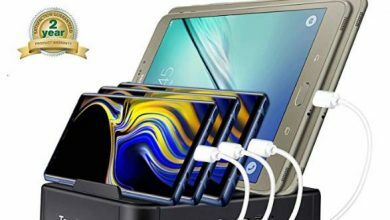 It can charge 4 devices simultaneously as quick as possible without any problem and I have tested this by plugging 4 different devices at a time. 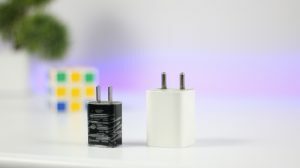 It also features Smart Flow Technology, which means that all 4 ports are equipped with Smart IC chipset, which recognizes your connected devices and delivers the most efficient and safe charge for your device, intelligently and efficiently. The output for 3 USB port is 12 watts (5 volts DC @ 2.4 amps) and 1 USB port is 17watts max (5 volts DC @ 3.4 amps) for each charging bay. 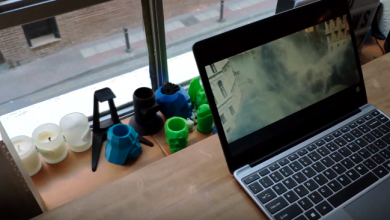 One of the most interesting feature that I liked about this dock is that it can also be used as a mobile stand. The flaps that cover the USB ports also double as stands for smartphone and tablets. However, you have to put your devices in landscape to keep the dock stable. The brackets covering the USB ports is a very smart idea. Along with protecting the ports from dust, those should also fend off any spills or other splashes of liquid. 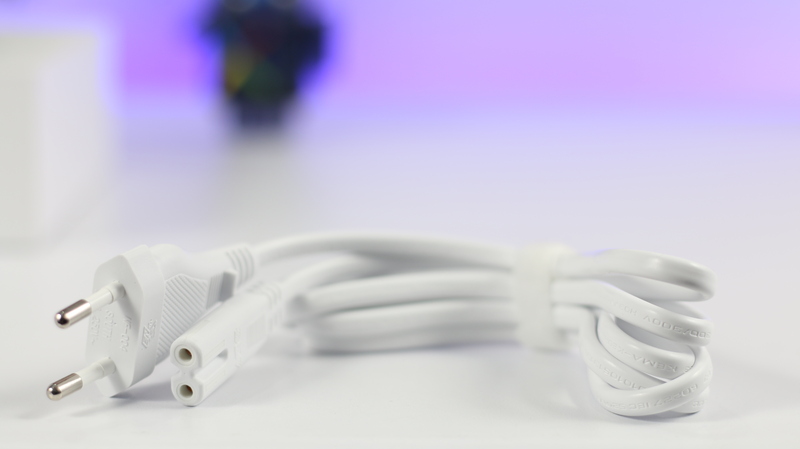 Now when I was setting up the charger, I ran into my first major problem — a 5-foot power cable that’s just a little too short for my setup, now this is very subjective you may or may not like a short cable but I would always rather have too much than too little. The cord also features a Velcro strap that makes it great to bundle up for travel. 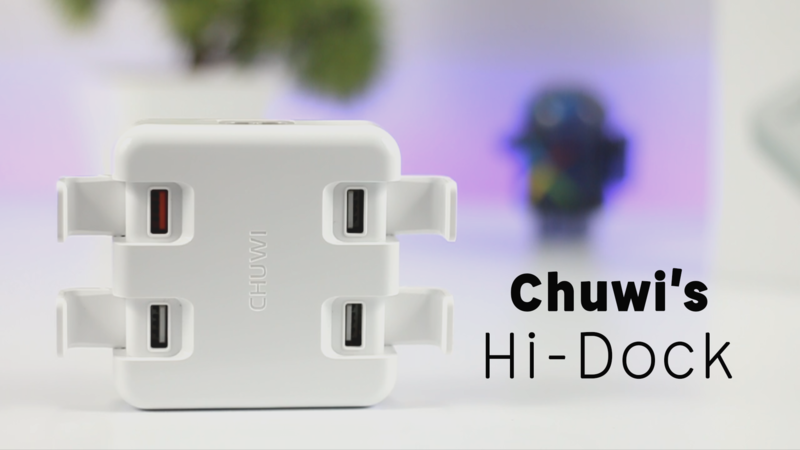 Now I am testing the Chuwi’s Hi-Dock since almost a week and I think it’s a great product for those users who own lots of different devices. In my opinion Chuwi Hi-Dock does what it says and it does it brilliantly. 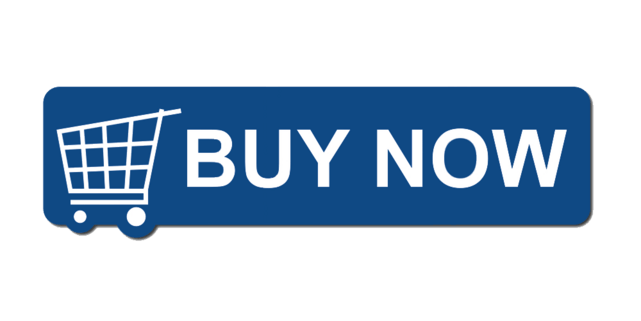 Its build quality is commendable and its design is quite fashionable and the best thing is that it can charge 4 devices at once without any issue. 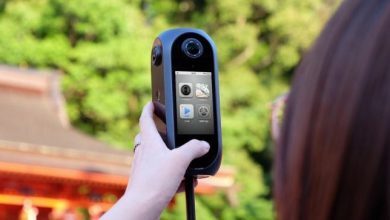 So, I will highly recommend this device if you want to buy one for yourself.